Over the next year, we’re pleased to be offering a series of family riding events in the areas of Jackson Heights, Corona, East Elmhurst and Elmhurst in the biking borough of Queens. The Jackson Heights Beautification Group wrote and won a “Parks Build Healthier Communities” grant. Those funds will help facilitate many of the rides and skills training we do. We’re blessed to be growing an active and involved community of bike riders and advocates, and are grateful to work with two other neighborhood groups, The Queens Bike Initiative and Ciclistas Latinoamericanos de Nueva York. Below is a rough sample of future events. Check back here or at Make Queens Safer on facebook for updates. 1. Feeder Ride to Zombie Ride. October 28th. 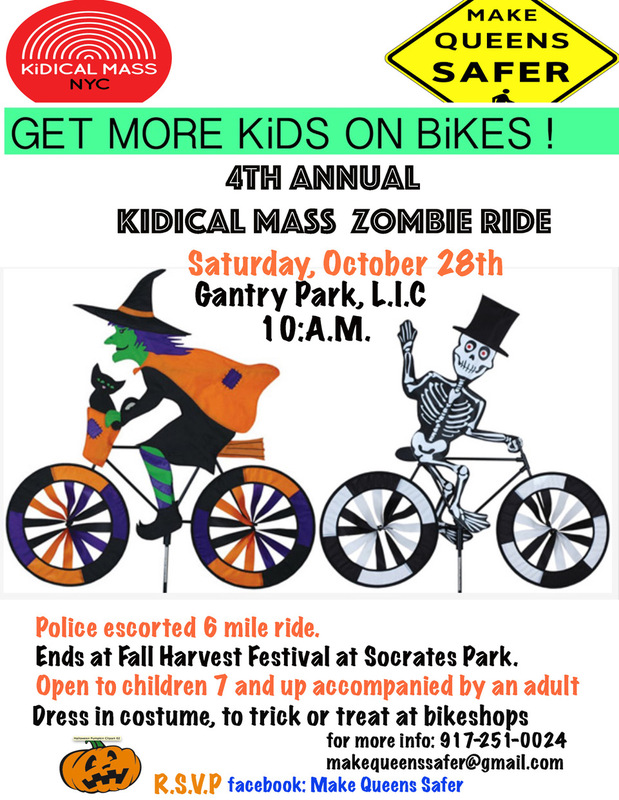 The fourth annual Zombie Ride is a police escorted tour of Gantry Park and Astoria which ends at the Socrates Sculpture Park for their fall harvest festival. It is a 6 mile ride. The feeder ride will take people from Corona, JH, Elmhurst on a route featuring the Queens Boulevard Bike Lane. (108, and 114 Precincts) Participants dress up in costume and trick or treat at bike shops along the route. 2. Jackson Heights Halloween Parade- Grant Kickoff October 31st. The Jackson Heights Halloween Parade will celebrate its 27th year with a trip down 37th Ave. Roughly 15 schools participate but many children in Elmhurst and Corona have only come as spectators. We’ll kick off the celebration of winning the grant with children participating in the parade as a bike brigade. We will ride/walk bikes with a banner announcing the ride schedule and hand out postcards with ride dates. We will also hand out bike safety materials to spectators. 3. Santa Ride- December 3rd. Originating with the bike group Ciclistas Latinoamericanos de Queens, this ride is accompanied by the 115 Precinct. It is a simple route featuring bike lane in East Elmhurst north of Northern Boulevard. Santa and his elves lead children safely between parks and landmarks with a stop for hot chocolate and bunelos to warm up on a cold day. Ride starts at Travers Park and ends at Playground for All Children. Flushing Meadows. 4. Family Biking Forum- March. Each year before official biking season begins, members of Make Queens Safer bring together organizations involved in bike safety and education to address the needs and concerns of families who wish to incorporate biking into their routines. People bike for transportation, recreation, for commutes to activities and for family time. This is a mix of DOT, NYPD, Dept. of Health, Transportation Alternatives, Qns Bike Initiative and other groups that have been on the forefront of increasing bike infrastructure and advocacy to make biking safer for everyone. 5. Bike Skills Park Event – Corona Golf Playground. It is very tough to teach young children how to safely ride in New York City. Our sidewalks are crowded and getting to a park can be a burden if you have to lug bicycles there in order to ride. By creating these bike riding practices events at local parks, we will bring together experts, willing volunteers, eager children and parents to practice riding and learning skills that could possibly prevent crashes, theft and anxiety. Bike Rodeo events make games out of learning skills such as riding slow, turning and being aware of traffic. 6. Mother’s Day Ride- Corona. In honor of the one year anniversary of the Mother’s Day event that supported safer bike and pedestrian access to Flushing Meadows Corona Park, we’ll gather to ride around the most recent DOT improvements to Corona. The 110th Precinct will participate. We will create a special token for all mothers who ride. Or perhaps have kids decorate a bike bell or helmet for their moms. 7. Pedal to Parks. This ride is based on a successful ride held in Astoria. “Friends of “ groups of various parks got together to showcase the beautiful playgrounds. This ride will be approximately 5 miles and show off East Elmhurst Playground, Junction Playground, Playground 90, Corona Golf Playground, Moore Park, Hinton Park and Simone Park. 8. Celebrating Bike Lanes- To World’s Fair Marina. The best part of riding is finding out how close we are to wonderful getaways. The World’s Fair Marina is a bit inaccessible by public transportation, but just a quick and safe ride by bike. Once there we’ll enjoy watching Dragon Boats, people fishing and small cruise ships while making a mural reimagining the location as a family friendly destination. 9. Flushing Bike Skills Park Event- The Park Between Us. This will be a complete tour around Flushing Meadows Corona Park, with a bit of history and nature observing tucked in. Riders will become aware of the parks past, it’s transformation for the World’s Fair, and be shown the many diverse uses from baseball, playgrounds, bike lessons, swimming, soccer as well as public art. This will bring together perhaps two groups, families from Flushing and families from Corona. 10. Kissena Corridor to Cunningham Park, FMCP Ride November 11th. Families from our part of Queens feel quite removed from nature, but it’s closer than you think! The Kissena Park Corridor is an off-road bike path that begins at Flushing Meadows park, goes alongside the Queens Botanic Garden and up a tree lined path filled with community gardens, sports and nature enthusiasts. Kissena Park by bike is a wonderful ride and destination that will truly show families the benefit of getting outdoors. Roughly 8 miles.